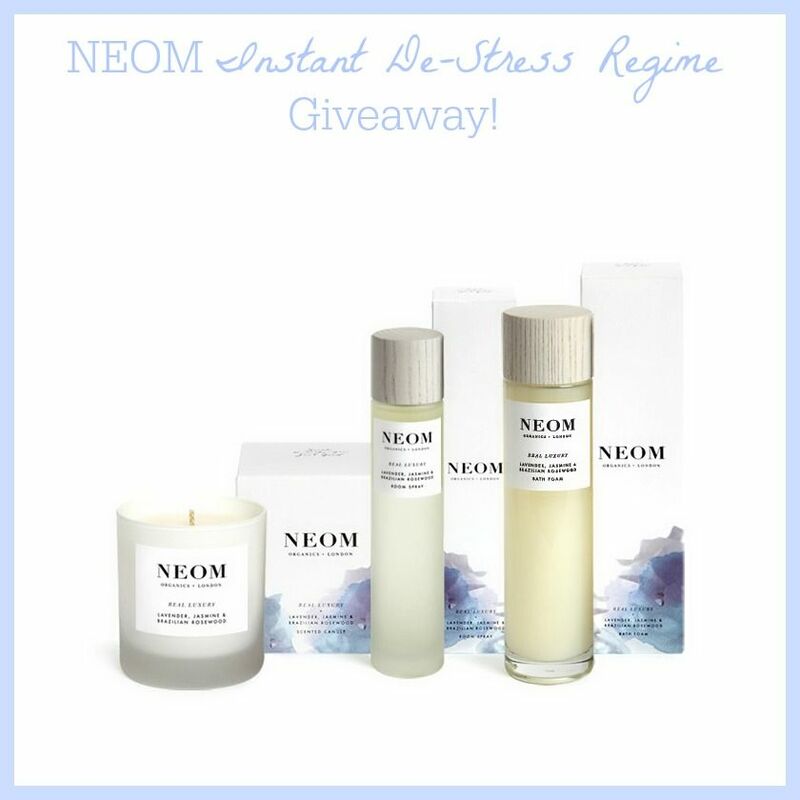 NEOM Organics - Instant De-Stress Regime GIVEAWAY! NEOM have become one of my favourite brands since last Christmas when I first purchased from their website. I was truly wowed by their exceptional service and I have been using their products ever since. Over the past year I have come to trust NEOM as a brand and it has been great to connect with a brand that really goes that extra mile. Not only do NEOM create beautiful home and lifestyle products, but they create them with different types of people and situations in mind. All NEOM products use a high grade of essential oils, which not only make them luxurious, but also fantastic therapies that can help to cure and alleviate a range of different issues. We’ve expertly twisted together 24 essential oils, all chosen for their ability to make you feel pampered, for this sophisticated and distinctive Neom signature blend. Jasmine is an oil long celebrated for its ability to lift the spirits and inspire optimism. For this unique blend we coupled it with rosewood, a comforting and warming oil with a balancing effect on the mind and body and ultra-relaxing lavender. By 2020 the top 4 diseases will be stress related. We all need to find extra ways to de-stress in our lives and we’ve created the perfect therapeutic de-stress regime using a complex blend of 24 ultra-relaxing and uplifting essential oils. • Light the candle to release the oils into the air; allow 20 minutes for the calming effect to begin (this time will decrease the more often you use the regime, since your body and mind will recognise the essential oils, known to work quicker the more often they’re used) and burn for at least two hours to ensure the natural wax burns cleanly and evenly to the edge. • Secondly run a warm bath - 40 degrees is the optimum stress-reducing temperature to work with our oils - and pour in a capful of bath foam, thus layering up the therapeutic benefits of the Real Luxury oils which are both inhaled (try at this point breathing in for 8 from the stomach and out for 4) and absorbed by your skin. • Finally spritz the air, your loungewear, a blanket, with the calming room spray - by now the oils will take instant effect - to complete your scent to instantly de-stress regime. - Leave a comment down below stating why you would like to win for an extra chance to win! Good luck lovelies and I hope you like this giveaway! Don't forget to check out NEOM for more information on their full product range! Because I'm trying to find a job and its damn stressful! Hello dear! I'm not entering because O don't know if it's international, but this giveaway is amazing!!! I love Neom organics! Stressed out, Zoned Out, Burnt Out and ALL OUT, rather fancy being Chilled Out! I would like to win it to share with my beautiful daughter - we both love Neom natural products and would love anything that would help us relax and wind down. Lovely giveaway, i would love to win so I can de-stress. Great way to de stress after a long week at work. With 2 young children my life is always stressful so could do with this! There are never enough hours in the day to achieve all I want and need to do. I can reach the end of the day and brain is still buzzing with what I have to do. A little bit of Neom pampering would be so relaxing. I've been suffering with insomnia after a close family member died a couple of months ago. Nothing else has worked, so would love to try this! I have real problems relaxing and de-stressing so something t help would be wonderful. Moving house. Need I say more! Would be nice to win this Neom De-stress Kit for when I am on night shift to help relax and get a better days sleep. What a generous giveaway! :) Just found your blog and I love it already! Because Neon products are great for de-stressing. I really need to destress! It would be really lovely to de-stress and pamper myself. Stressed out, Burnt Out, Zoned Out and All Out, would rather like to be chilled out! These Neom products look great for when I have come off night shift and need to relax more. Would love to win after recently having surgery and not being able to sleep well for over 12 months. Two more ops to go and then I may be able to manage without NEOM. I would love to win because I'm still get to find that perfect de-stressing routine before sleep! & This trio sounds absolutely dreamy :)! I really need something just to take a moment and relax as I rarely get to do it. i always try to test new brands, so that would be the perfcet oportunity! I'm getting married very soon so could use some relaxing me time! I love NEOM and would like a treat. I work for myself, which means I don't get a huge amount of time off...I'd love to destress! Never tried Neom and I would love to try them! i am always spending too much on beauty products, maybe i will save a bit if i win the giveaway! I'm about to go back to work after having my baby. It's stressful enough already! To de-stress after a long week at work. Because my skin & me would like uplifting! I don't relax but for the last month or so Ive tried getting in to the habbit of sitting on my sofa on a saturday night and watching a movie to help me relax - I feel its helping - would love to add this to the mix . Would love to win so I can de-stress!